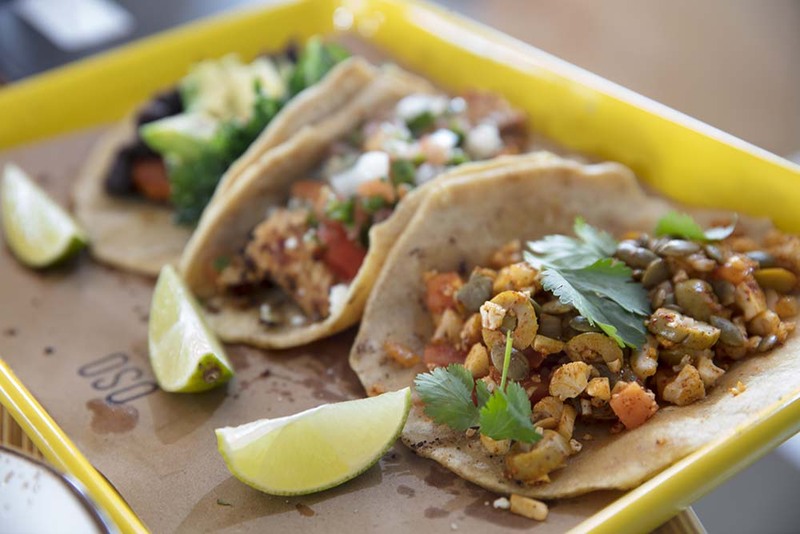 Taco options at Oso are abundant, including sweet potato, chicken and cauliflower picadillo. Oso on Paseo, Humankind Hospitality’s newest adventure in OKC, specializes in Mexican dishes and drinks. There’s a big blue bear now standing on the namesake street of a trendy arts district in Oklahoma City. His name? Oso Paseo. Oso, Spanish for “bear,” boasts its own bear mascot peeking in the window. 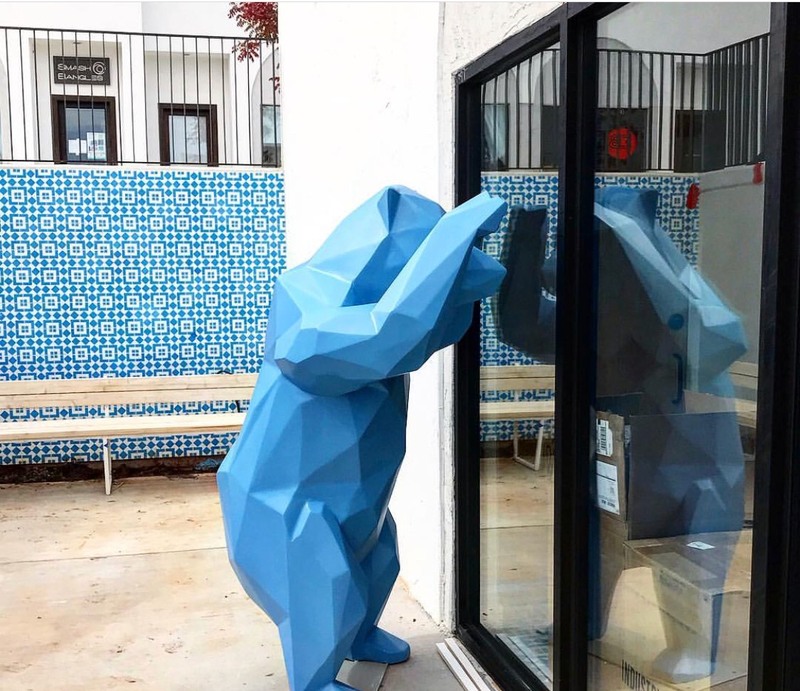 Bolted to the pavement, this oso (Spanish for bear) is a geometric sculpture staring into the front windows of the latest and greatest restaurant from Shaun Fiaccone of Humankind Hospitality Services. Oso on Paseo, which opened in late October, joins other popular restaurants and watering holes in the Paseo Arts District, like Picasso’s and The Other Room. With Oso, Humankind has birthed the first of fraternal twins; Frida’s, the next child, should arrive in the spring. The once bare corner on a tiny hill has been beautifully transformed by Jeremy Foraker’s Pueblo at Paseo project, and Oso is the anchor for this sun-bleached, white, multilevel space. Kindt Steven Myers, hospitality director for Humankind, explains why this bear is perfect for Paseo. Oso is well-suited for Paseo, whose economic success parallels its resurgence as a walkable area boasting retail and art galleries. Chef Ryan Parrot, partner in Oso and culinary director for Humankind, and chef de cuisine Chris McKenna, the bear of a man wearing the golden toque in Oso’s kitchen, put their heads together and came up with dishes that any Mexican food lover would enjoy. 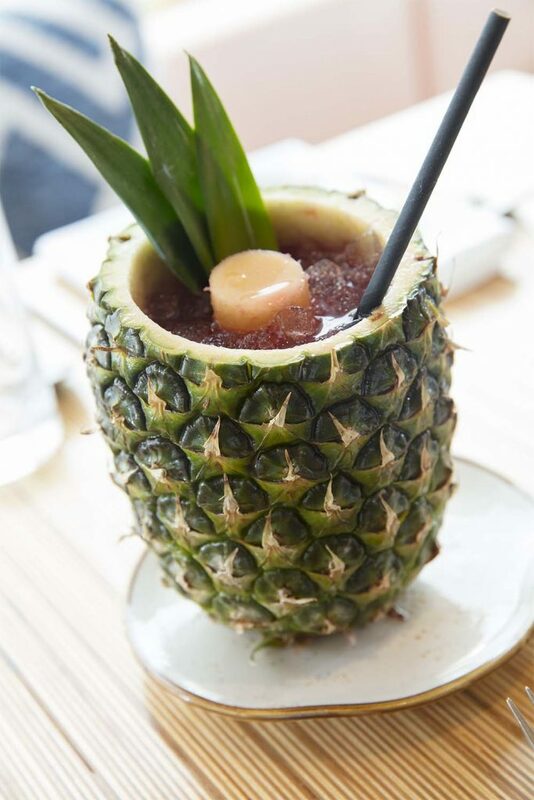 Oso’s Vallarta Colada includes Mezcal tequila, lime, coconut, Sabrina Solution and honey. The Montezuma contains orange juice, lemon juice, dark rum, white tequila, simple syrup and grenadine. 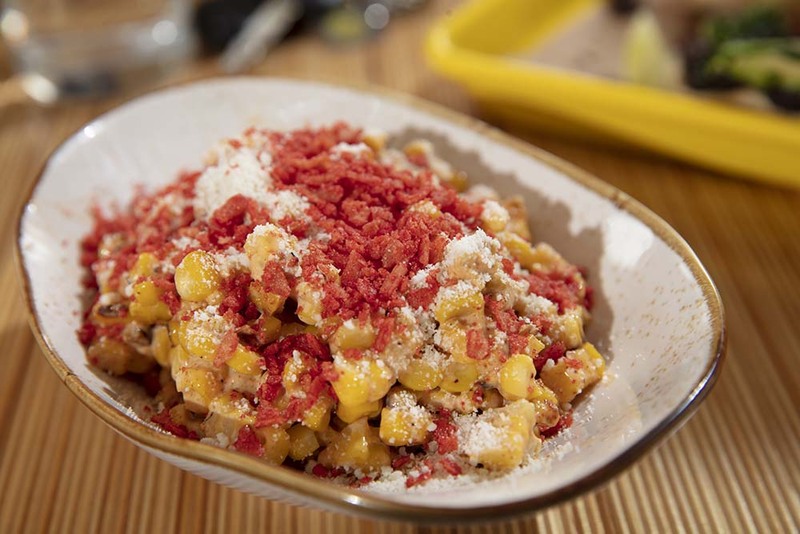 Street corn at Oso is roasted off the cob with chipotle crema, cotija and takis. Along with quesadillas, carne asada platters and a kids menu, there are also duros de harina, the wagon-wheel pasta street food. These fried, puffy balls of goodness are seasoned with Tajin. “Duros will be handed out to everyone, much like chips and salsa in other places,” Parrot says. Notable among the street-style tacos are those filled with burnt ends of Kansas City brisket, pork belly, al pastor or deliciously marinated chicken. Vegans are not an afterthought; they’re actually a priority considering who frequents the arts district and the popularity of plant-based dining. Two standouts poke the bear: a taco featuring cauliflower, green olives and golden raisins, and another with grilled sweet potato, crispy kale and black beans. Both are magical and tie in perfectly with Oso’s salsas and toppings. Cole offers classic blends served in commissioned, handmade tiki cups. 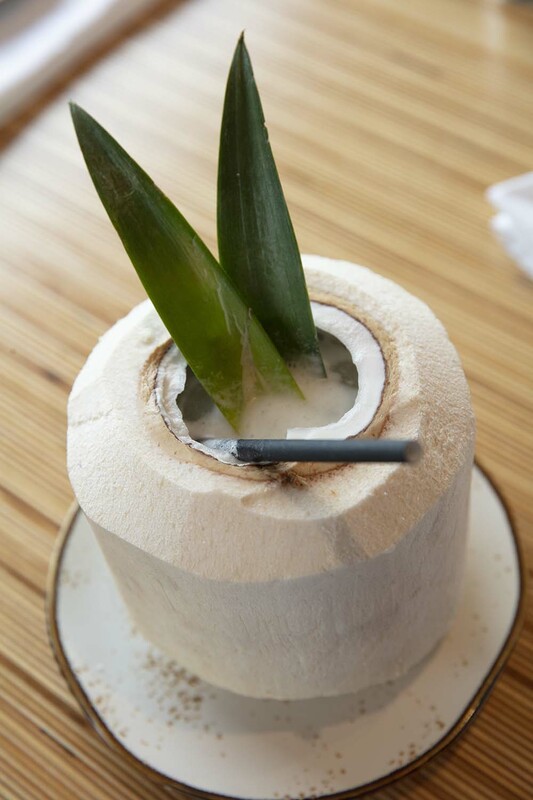 House specialties, also crafted by Cole for Oso, include the vallarta colada (a play on pina colada), served in a hollowed-out coconut, and the flavorful Oaxaca banana daiquiri with Paranubes rum. If you want a delicious and memorable time in OKC, consider the Paseo Arts District. Then look for the bear – Oso is guaranteed to deliver with a roar.